I, actually, wasn't really planning to post/share it in Minitokyo at all. So, in spite of this 'break' I seemingly, at first sight, have taken, I really did not: I've been using photoshop as much as ever and I am flooded until beyond my neck into anime/manga/Clamp, it never changed at any moment; it's just that I haven't been making time consuming works of arts as I did before, and I don't spend as much time as I did in the past in MT, that is true. 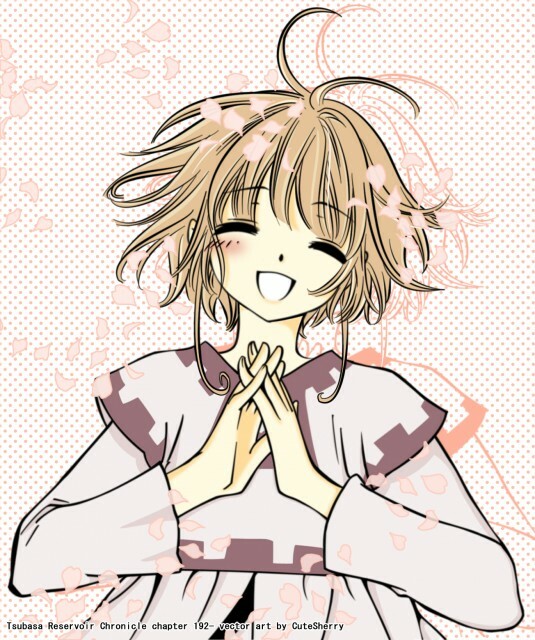 This is little princess Sakura from chapter 192. I really got nothing much to say expect that my objective was to make her as cute as possible when coloring her, and I think the result is the one I wanted. Wowww! Explendid vector you have done a great job.. congratulations :). i loved this scence from the manga and you tranformed young Sakura into a beautiful vector art! O that's so beautiful! You're so skilled! I really Like your artwork! Just wanna say that I download that picture of it and I use it as my Display picture. Is that alright? :\ Thanks! Sakura smile is always amazing, present or past..
Sakura is so adorable and lovely, so pretty, love it, thanks. Wow! That's really good! I like how you added the pink on her cheek. Such a cute and sweet image of young Sakura! I just love it!